Rather than brave what many consider to be “amateur night” in terms of responsible drinking on New Year’s Eve, Dan and I prefer to stay in, cook a nice meal and watch an old classic movie. There is comfort in our little New Year’s Eve ritual, in that it has become our annual tradition and it involves our shared loves of good food and movies. Every year we look forward to planning the menu (we try to cook something new and maybe a bit more extravagant than our usual cooking) and selecting the movie (which can be difficult, as classic movies aren’t really our thing, aside from this one night each year.) Our choices aren’t always successful — beef wellington several years ago was a colossal failure (way too much effort for a mediocre – at best – result), but we always enjoy the process and our evening together. This year was no exception, and we succeeded with our food and movie choices as well. We found the short ribs recipe in the cookbook “Restaurant Favorites at Home” and were surprised by how easy it was to make with simple ingredients and several hours of braising time. We chose the movie “To Have and Have Not” because it stars the legendary onscreen (and off!) couple Humphrey Bogart and Lauren Bacall, and because it is based on a novel by Ernest Hemingway. The fork-tender ribs literally fell off the bone when we dished them out of the rich (but not too rich! ), flavorful sauce. The movie was quite entertaining, with a nice mix of charm, humor, romance and intrigue. We love our New Year’s Eve tradition, especially as a reminder that a good meal and quiet evening together can be cause for celebration any time of the year. 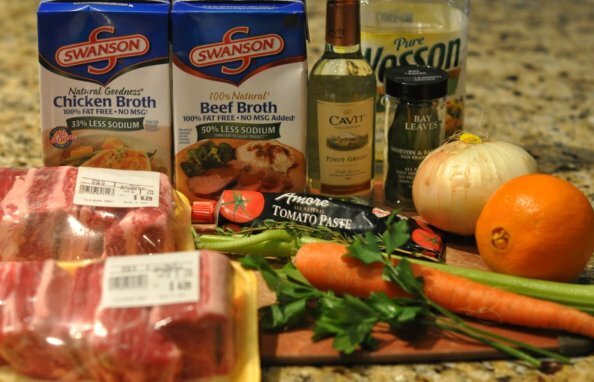 In addition to 3 pounds of short ribs, the recipe calls for a teaspoon of vegetable or canola oil, half an onion, 1 carrot, 1 celery rib, 2 tablespoons tomato paste, 1 cup dry white wine (or vermouth), 2 1/4 cups chicken broth, 1 cup beef broth, 1 tablespoon orange zest, 2 sprigs fresh thyme, 2 sprigs fresh parsley and 2 bay leaves. The recipe is adapted from a dish served at Mockingbird Bistro in Houston, TX and is somewhat unique in that it uses white wine instead of the traditional red wine used in a lot of braised short rib recipes. The white wine makes the sauce a bit less rich, although it’s still plenty luscious and meaty. The adaptation uses the combination of chicken and beef broth instead of the veal stock used in Mockingbird Bistro’s version, but if you have access to veal stock, by all means use it! The recipe recommends using “English-style” short ribs, which are butchered with the bone, such that each rib has a piece of bone surrounded by meat (and fat.) We scored the top layer of fat on each rib (the bone is just underneath this layer) by making several diagonal cuts. Short ribs are notoriously fatty, so you’ll want to trim a lot of the excess fat (aside from the top layer), but don’t worry about getting all of it — you won’t have much rib left if you remove all the fat! Heat the vegetable oil in a large Dutch oven (or other oven-safe, heavy-bottomed pot) over medium-high heat, add the ribs and cook, turning as needed, until the ribs are browned on all sides — about 6-8 minutes. Remove the ribs to a plate and set them aside. Spoon out (and discard) all but about 1 tablespoon of rendered fat from the Dutch oven. Add the chopped onion, carrot, celery and a generous dash of salt, then cook until the vegetables begin to soften — about 5-6 minutes. Add the wine, scraping up any browned bits from the bottom of the pot, then add the chicken broth, beef broth, orange zest, thyme, parsley and bay leaves and bring the mixture to a boil. Put the ribs back in the pot, submerge them in the liquid and return to a boil. Cover the pot and place it in the oven preheated to 325 degrees. Cook the ribs until the meat is tender and falling off the bones — about 2-3 hours. Remove the ribs from the braise, transfer them to a plate or cookie sheet, cover them with foil and return them to the oven at 200 degrees to keep warm. Allow the braising liquid to cool a bit so that the fat rises to the top, then skim off and discard the fat. Remove and discard the bay leaves and thyme and parsley sprigs. Turn up the heat to medium-high and bring the braising liquid to a simmer, then cook until the sauce thickens, stirring often — about 10-15 minutes. Our sauce didn’t seem to be thickening much, so we added a cornstarch slurry (cornstarch and water) to help it along. Place the ribs on a plate, spoon the sauce over top and serve. We served ours with a butternut squash orzo (sounds better than it tasted) and balsamic-roasted brussels sprouts (unfortunately over-cooked.) But the short ribs were perfect! Even better, a few days later — the leftover rib meat, shredded and served with the sauce over cooked, lightly buttered egg noodles. We won’t be waiting until another special occasion to make these ribs again — the first Thursday in March will do just fine. We highly recommend you take the time (and minimal effort) to braise short ribs — or make some other delicious, slow-cooked delicacy — when you have the opportunity, whether it’s a momentous one or not. You and your family deserve it. In closing, one of our favorite things about watching a classic movie is when we recognize a famous line that we previously had no idea originated in that particular film. Like when Bacall says to Bogart: “You know how to whistle, don’t you, Steve? You just put your lips together and…blow.” Now that’s a classic.